In the words of Craig David! “what’s your flava” Bank accounts are going to cry but our shelves are going to have joy, well that’s only if we get lucky to pick up more Ice-cream Dino’s! 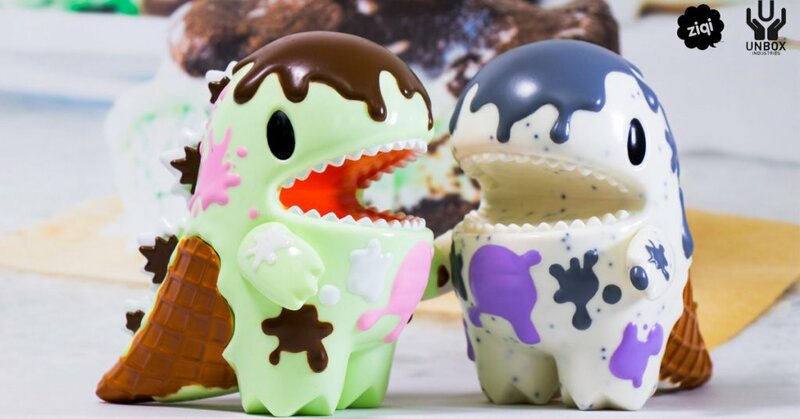 “Not one, not two but three Ziqi wu‘s Ice Cream Dinos will be up for grabs this weekend. “Why so many? Unbox are hoping that multiple choices mean multiple opportunities for collectors to obtain one!” CHOCOLATE MINT ICE CREAM’ & COOKIES & CREAM’ EDITION Little Ice cream Dino will join the Toy Station 88 anniversary edition for TODAYS release. LIMIT ONE PER CUSTOMER Per version.